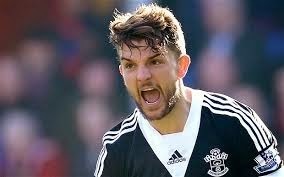 Jay Rodriguez has signed a new four-year contract that will keep him at Southampton until the summer of 2019. Rodriguez has not played for Southampton since rupturing his cruciate knee ligament in the defeat to Manchester City in April 2014, but he has returned to full training in the hope of featuring before the season’s end. The 25-year-old, who has scored 26 goals in 26 appearances for the Saints, has regularly been linked with a move away from St Mary’s but he has committed his future to the club by signing a four-year contract. “I’m delighted. It’s a great club and we’ve done amazingly this year,” Rodriguez told Southampton’s official YouTube channel. “It’s been a tough year for myself being out, but I’m really delighted to sign the contract. It’s now about looking forward to the future. Manager Ronald Koeman had recently spoken of his desire to keep Rodriguez at the club and he is delighted with the contract extension. “This is very good news for the club because there was some speculation about Jay and interest from other big clubs, so it is a compliment to the club that we have an agreement,” he said. “It has been a difficult time for Jay who has been doing everything to come back in a good shape.